Anyone remember that game “never have I ever…”? Well, never have I ever met someone that doesn’t love a good, chewy bagel. This recipe is based on Peter Reinhart’s, in his super awesome book, The Bread Baker’s Apprentice. I bake a lot of bread, and this is honestly the only book you knead (hehe, get it?) to be a successful bread baker. It is important to note that kneading your dough builds gluten, gluten is what makes bread chewy, and a hot hot oven gives bread a crackly brown crust while keeping a moist chewy crumb (the inside of the bread). I like to use active dry yeast rather than instant yeast. It requires a longer amount of time to rise, but that longer rise time allows for more flavor to develop. Yay, fermentation! If I ever open up a specialty shop, I might just be kooky enough to call it All Things Yeasty. Bread, cheese, wine, pickles, all of these wonderful items use fermentation to become the tasty treats they are. Mix above items together to create a a smooth, sticky batter. Cover the bowl with a damp towel or plastic wrap. Allow to rest for 2 hours or until it has doubled in size. This time does not have to be exact, it is just a guideline. I use a heavy hand with the sugar in this recipe b/c it gives the crust of the bagels a beautiful golden brown crust. Add above ingredients to the first mixture and knead for about 10 minutes. I normally use my kitchenaid stand mixer to mix my dough, but it kicked the dust after only 1 minute of kneading. So I did it by hand. 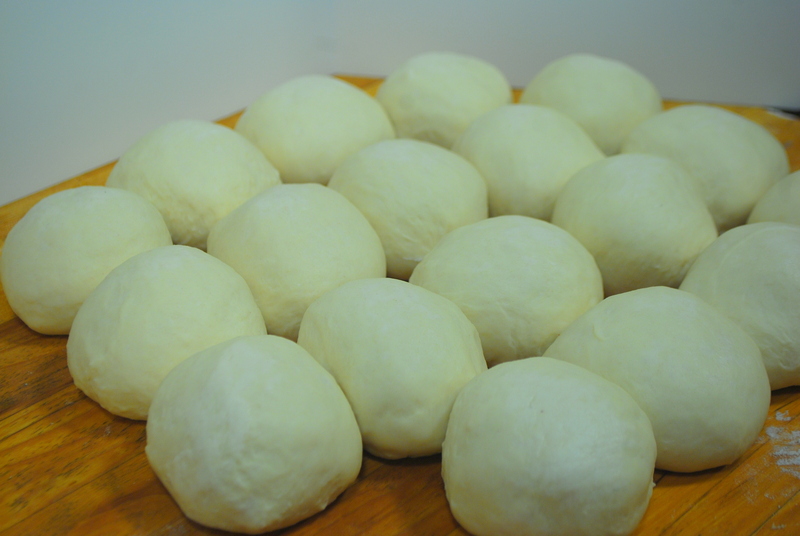 Bagel dough is maybe the most difficult to knead because it is firmer than most other doughs. If it is still sticky or tacky at all, add more flour until it is satiny to the touch. Likewise, if it is dry and rips, add a few more drops of water. Immediately portion into 4 ounce portions, approximately the size of a standard dinner roll and shape into rolls. Cover with a damp towel or plastic wrap and allow to rest for 20 minutes. After the 20 minutes are up, you get to shape your bagels. Poke a hole in the center and keep stretching out until the hole is 1-2″ wide. Place each bagel on a sheet pan lined with parchment paper or a silicone mat and cover with a damp towel or spray with oil and cover with plastic wrap. Allow to rest for another 20 minutes, then place in the refrigerator overnight. 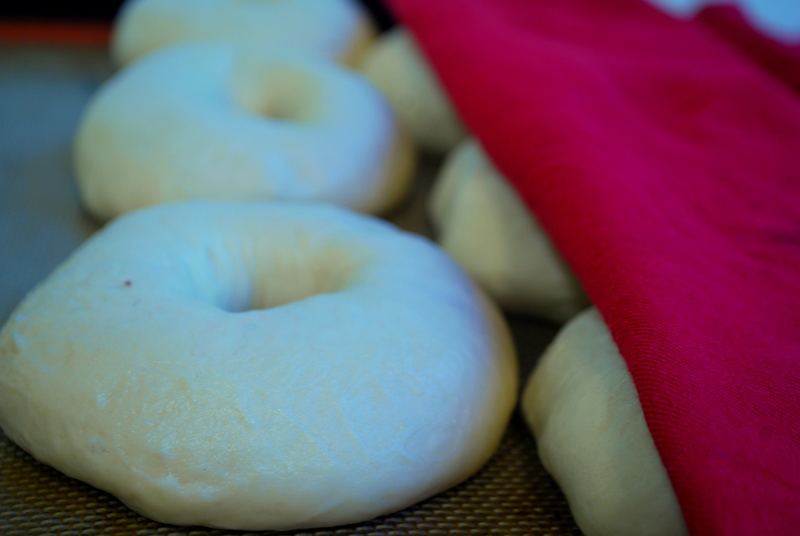 Before you take the bagels out of the fridge, preheat your oven to 500F and bring a wide brimmed pot to a boil. Add 1 tablespoon of baking soda to the water. Get all of the toppings you will use ready on the counter. I use poppy seeds, sesame seeds, and dehydrated onion as toppings. I also use a seed mix of poppy, sesame, celery, and caraway for my “everything” bagels. 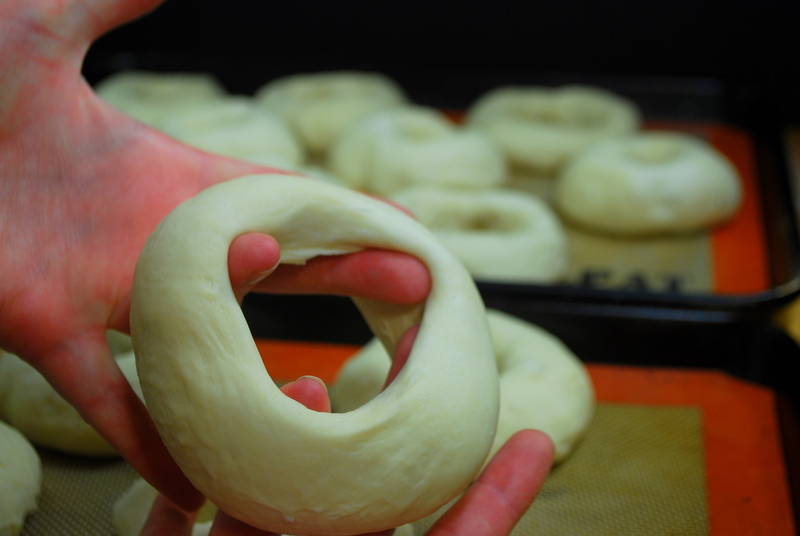 Boil a few bagels at a time for 1 minute on each side, flipping with a slotted spoon. 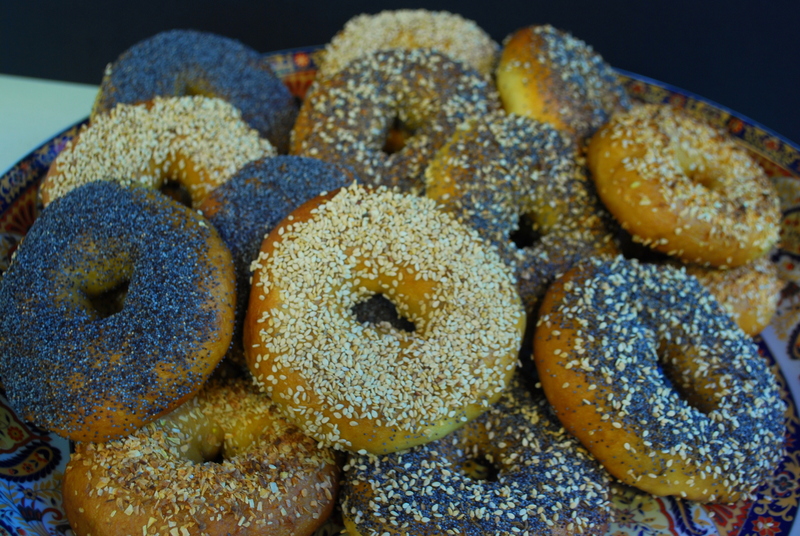 Immediately after removing bagels from pot and placing on baking sheet, top with seeds. The sooner you apply the toppings, the better they will stick. Bake for 5 minutes at 500F, rotate pans and lower temperature to 450F. Continue to bake for another 10 minutes, or until the bagels are golden brown. Place on baker’s rack to cool and serve up with cream cheese. 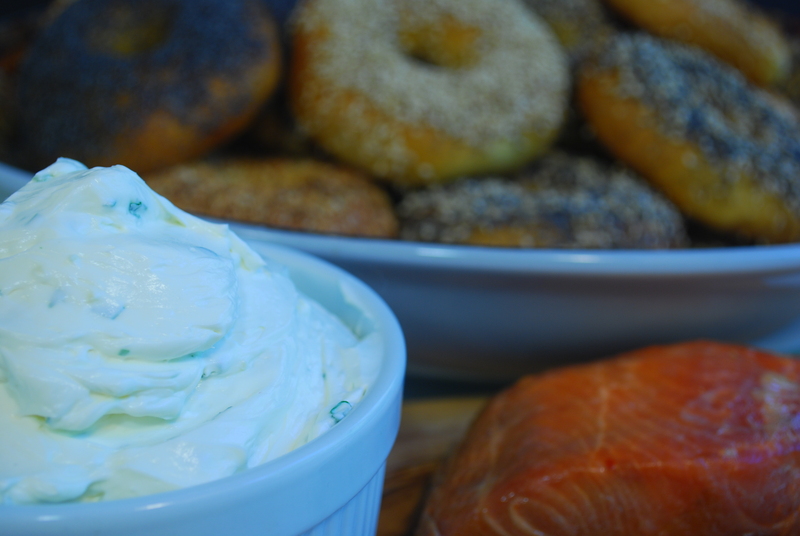 I whip up some plain cream cheese with a few cloves of minced garlic, a variety of fresh herbs such as dill, parsley, green onion, or chives and a splash of lemon juice. Set out some smoked salmon, sliced tomatoes, jams, toasted nuts and other spreads to make a truly epic bagel bar for your next brunch. Your blog Lauren has been so much fun to read and well done. All of the recipes look amazing, but it’s not only the food, but the way your blog has been put together and your videos are the best!! Thank you. Thank you Gloria! I’m so glad you are enjoying it. I hope to start posting more videos soon. It has been super fun learning about photography and videography and being able to finally catalog my favorite recipes as well as experimenting with new ones. Can you add ingredients inside the dough to make blueberry or raisin bagels? How would you do that? I haven’t tried that yet, but I would suggest adding those ingredients to your dough toward the end of the kneading process. Local specialty shops usually have some option. Costco carries it, prior to the French trout caviar, they had a salmon roe that was a similar price point. About $10. They also have a sturgeon caviar, but that costs at least $60. That could be nice for a New Year’s Eve indulgence. Yes, for Christmas this year, I want food. Thanks sis!